According to a Texan and Californian who've tried ~legit~ queso. 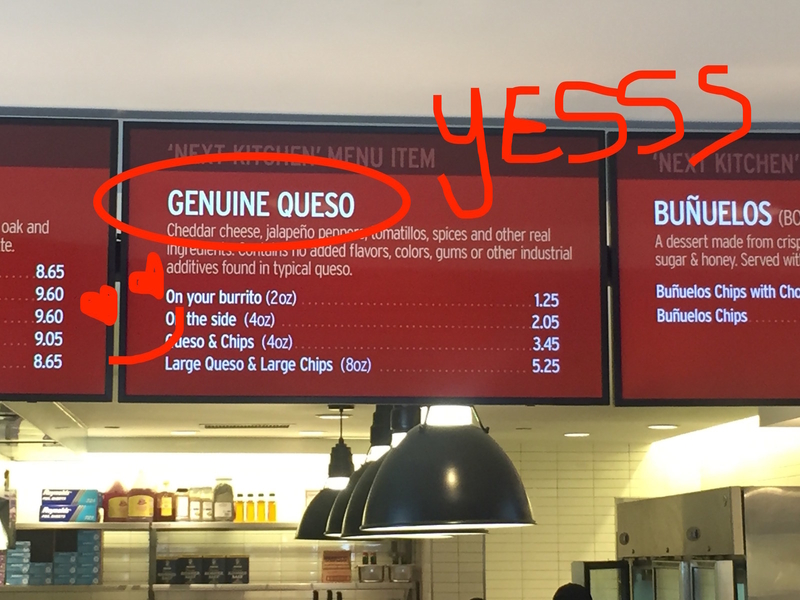 This week, Chipotle announced they'd FINALLY start testing queso. The bad news is that they're only testing it at a single NYC location. The good news? It's a 15-minute walk from BuzzFeed HQ. So — warm, humid city air notwithstanding — we decided we HAD to make the trek. Between the two of us — Natalie's from Texas, Michelle's from California — we're both Tex-Mex fans and have had the chance to try real queso. 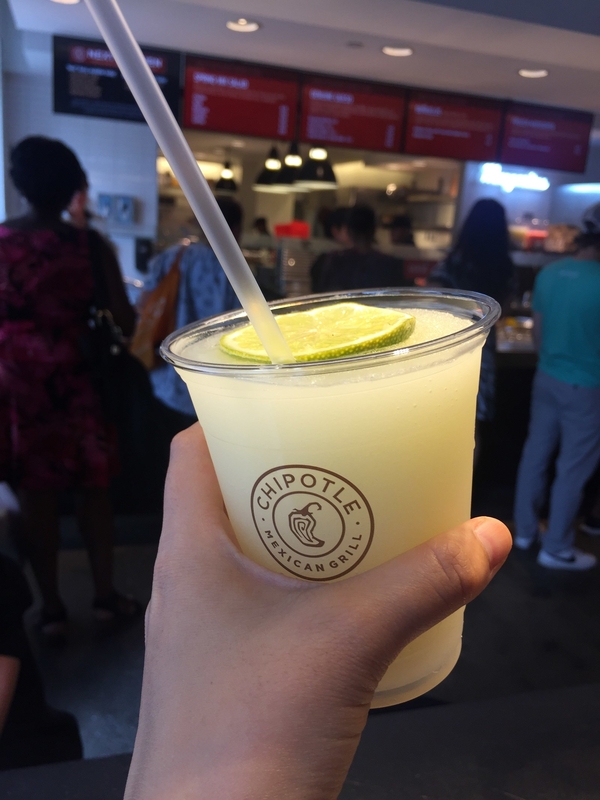 But we were super curious about what Chipotle's version would taste like! From the outside, the location looks prettyyy similar to any ol' Chipotle storefront. Inside, Chipotle's Next Kitchen — their version of a public test kitchen — is a place where the chain can "test various innovations, from new menu items and modified recipes to different ingredients and new cooking techniques," a Chipotle spokesperson told BuzzFeed Food. 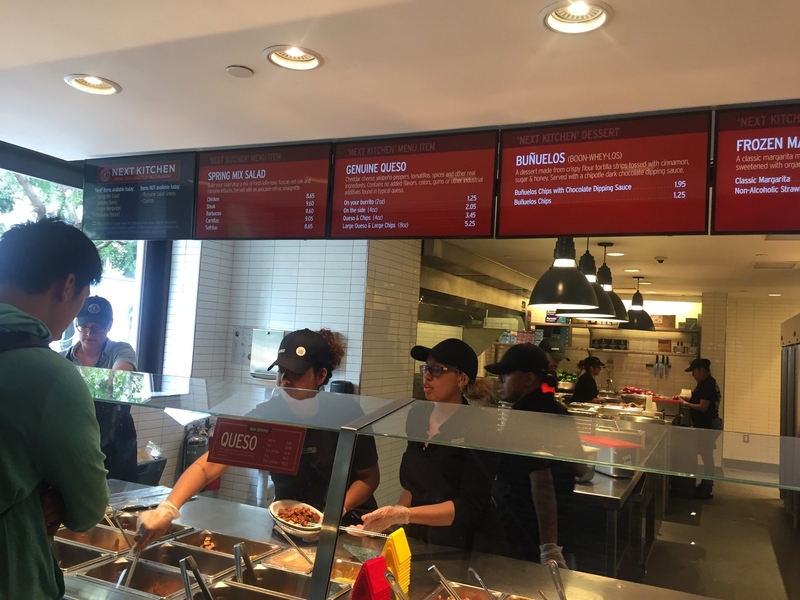 But take a closer look at the menu, and Chipotle ~surprises~ await. Obviously, we ordered the queso — which you can get on a burrito or in two different sizes (4 oz. and 8 oz.) with a side of chips. We got the 4 oz. queso with chips, which was $3.45. General consensus? It was slightly spicy, gritty, and lacked the gooeyness of standard queso, but still — pretty tasty! Michelle: Generally, I liked it. I loved the spiciness and the fact that it was textured with bits of black and red pepper (at least, I think that's what those colored specks were.) I do wish it was gooier. The queso that I've tried in both Texas and Southern California has always been either thick or super hot and smooth, like nacho cheese. This queso seems to fall right in-between, having the texture of a DIY queso that either needs more dairy, Velveeta, or some kind of emulsifier. IDK, maybe it's just healthier? Natalie: I grew up in Houston suburbia and spent my college years in San Antonio, so I have a lot of good (and not-so-good) quesos under my belt. And this tasted like good queso. Not spicy but with a little heat, not chunky but with a few little somethings here and there. 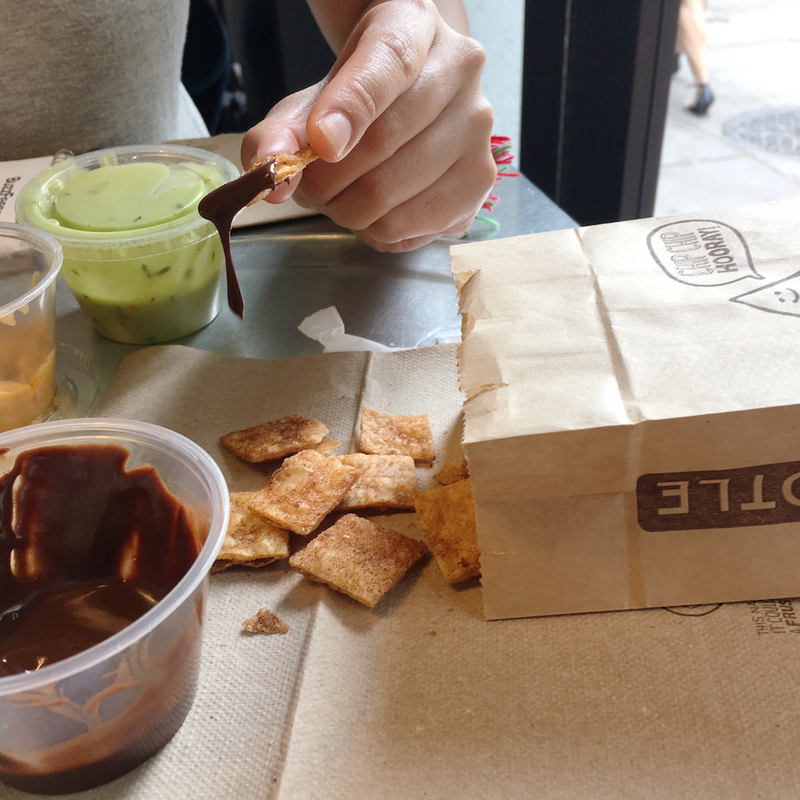 When you dip your chip in, the queso coats it ~perfectly~. But the other thing that makes queso addictive is its smooth, lovely texture...and this was definitely gritty. I know that there aren't any "added flavors, colors, gums, or industrial additives" in this dip, but you don't need Velveeta to get a smooth melt on your real cheese. I have my fingers crossed that this batch was just off — I'll definitely be ordering it again. And if it's smoother in the future, I would bet money that I eat Chipotle chips and queso at least once every month. 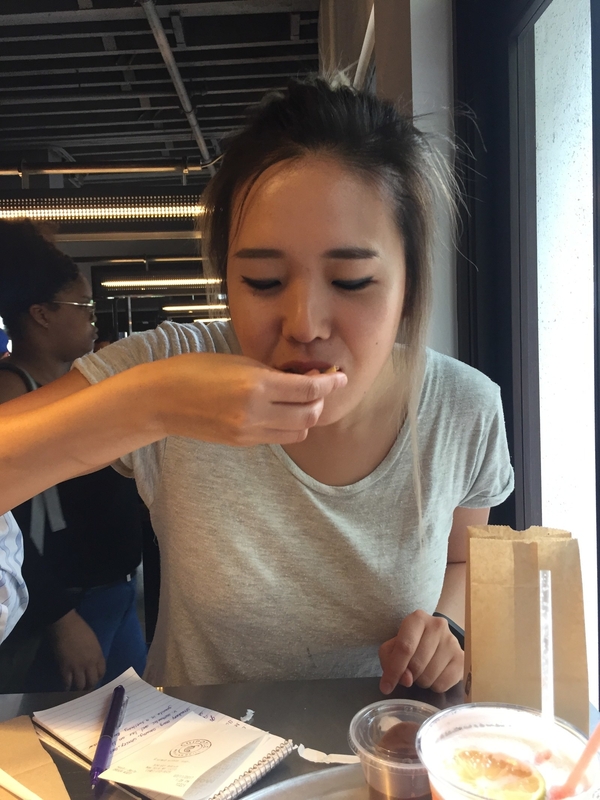 We also tried Chipotle's first dessert: buñuelos. They basically looked like XL Cinnamon Toast Crunch pieces and were served with a pepper chocolate dipping sauce. Michelle: I have a huge sweet tooth and could not stop munching on these. They're buttery, light, flaky, and served with a cool dipping sauce that tasted like cinnamon-y dark chocolate. I loved the sauce so much that after finishing the buñuelos, I used some of the tortilla chips to scoop up the remaining chocolate. 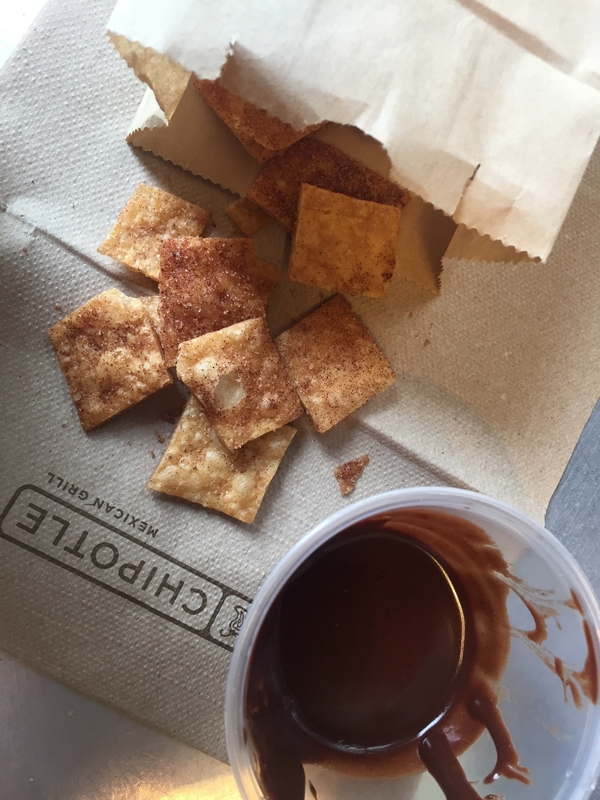 Natalie: These are, like, gourmet Cinnamon Toast Crunch — that you get to dip in a spiced chocolate sauce. Like, how do you go wrong with fried tortillas coated in cinnamon sugar??? If my parents and sister and I all went out together, though, we'd each have to get our very own order to avoid an outright war. 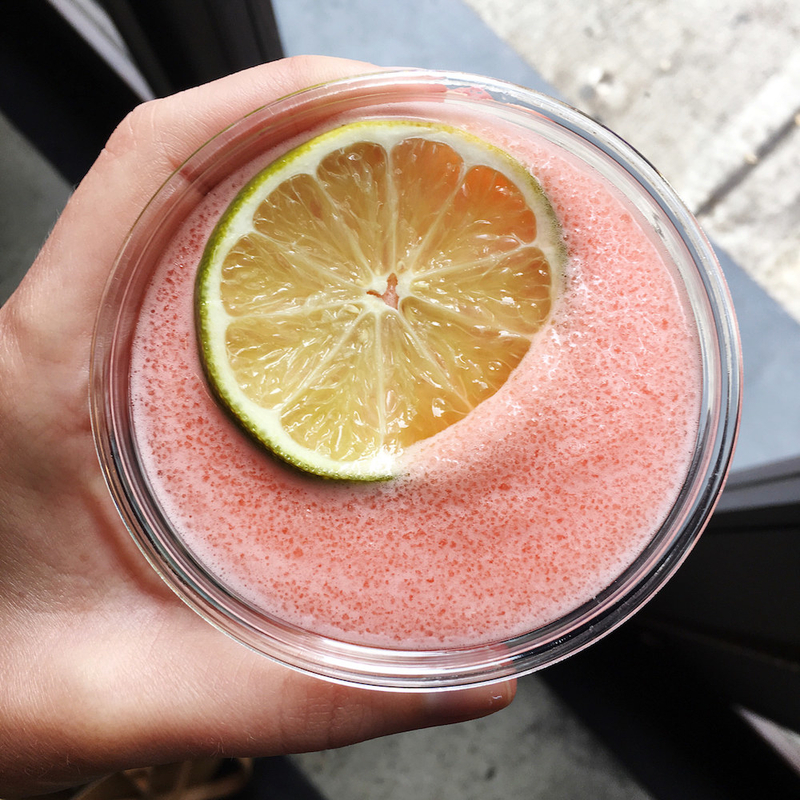 The location was ALSO testing margaritas — a classic version and a nonalcoholic strawberry-flavored one. We clearly had to try both. Michelle: The nonalcoholic strawberry-flavored margarita tasted like a strawberry granita in the middle of a sweltering afternoon in Italy, and I LOVED it. It was like a refreshing blend of ripe strawberries, ice, and a bit of extra sweetener — perfect for a hot July afternoon. I honestly would probably order this nonalcoholic margarita over the classic one, which was delicious as well, but not exactly something I could handle on my lunch break. Natalie: I enjoyed both margs, although they were a little sweet for my taste. I could totally see a family burrito dinner where the kids all get the strawberry slush and the parents each sip a lime version. The strawberry one definitely had real strawberries (maybe frozen ones, but who cares)! I really wished for more of the Sauza tequila that they swore was in the lime marg — I could tell there was something boozy in there, but I prefer to taste some more of the tequila, not just all lime and sweetener. But that won't stop me from ordering one on a hot summer evening, if they go to all locations! 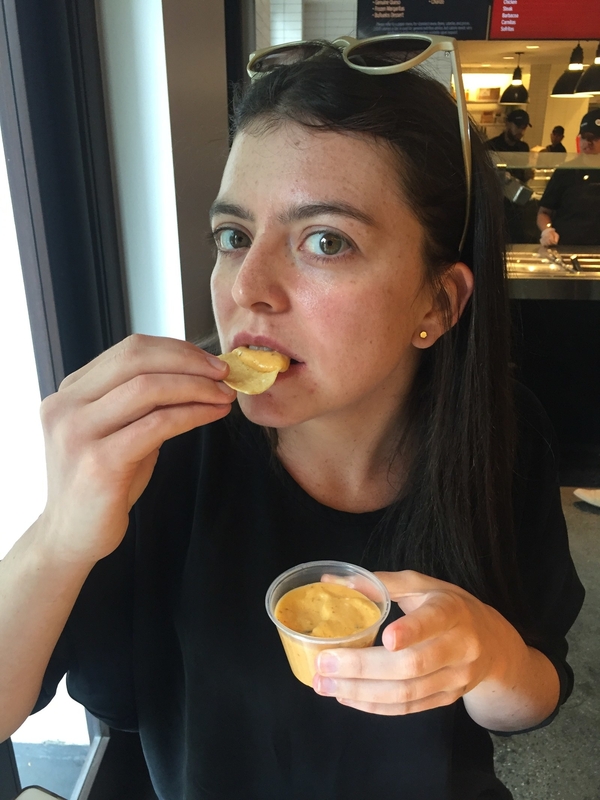 TL;DR: The queso wasn't the smoothest thing ever — but it was still tasty. The buñuelos were 💯. The margs weren't boozy enough...and maybe too sweet for some people's taste. And FYI, since the items have been in testing for less than 60 days, the restaurant couldn't provide any nutritional info, but Chipotle says its queso is "gluten-free, non-GMO and free of preservatives." With regards to whether the queso will be offered at other locations, a Chipotle spokesperson told BuzzFeed Food, "We’ll see how it goes in this test and take it from there." Would you try Chipotle's queso? Hard yes — I've been waiting for this for forever! Maybe if someone shared some of theirs. Eh, it doesn't look that great.